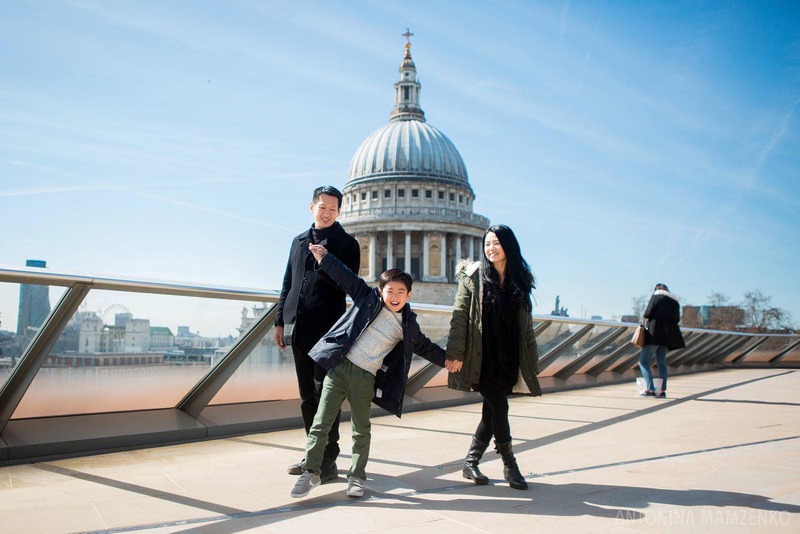 One of the questions I often get asked is “Where should we go to take our family photos in London”, especially by families planning a vacation family photoshoot while they are visiting London from overseas – or expats moving out and wanting to do a farewell photoshoot with a distinct London feel to it. 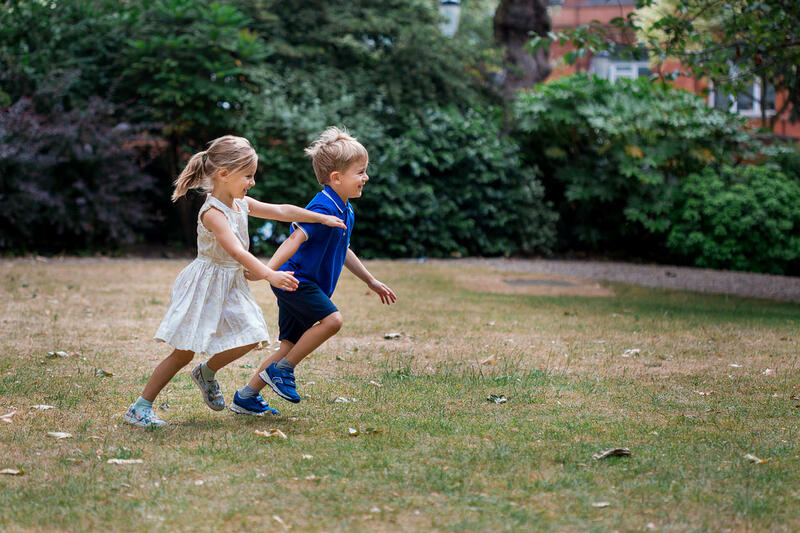 I usually recommend having your family photoshoot in a place that’s special to you, but if you’re just visiting and want to capture the essence of your vacation here in London – or create a unique set of images you can’t create back home – I’ve curated this list of some of my favourite locations for a family photoshoots in the city. The first thing that anyone thinks when they think London is probably Big Ben as well as the nearby London Eye (fun fact: London Eye was supposed to be a temporary structure). 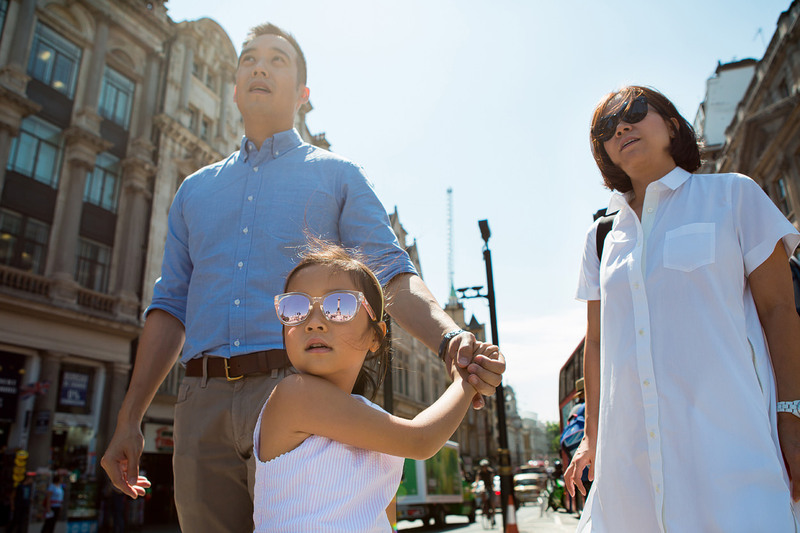 This area is great for those iconic London shots but beware the crowds – we’d need to start pretty early to be more comfortable exploring and walking between these two landmarks. In addition to London Eye and Big Ben, there are plenty of other photographic opportunities nearby, from the iconic red telephone booths at Parliament Square, to the Southbank Centre and it’s ever changing installations (an urban beach and the “Appearing Rooms” fountain in the summer, a bustling Christmas market in November and December) and of course the street performers. 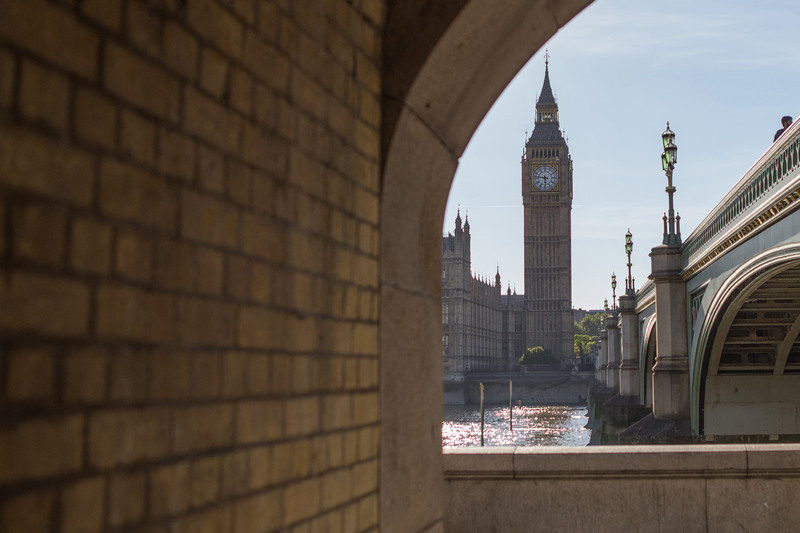 Big Ben Restoration: Our famous landmark is currently undergoing restoration and is covered with scaffolding – making it not particularly photogenic until 2021. 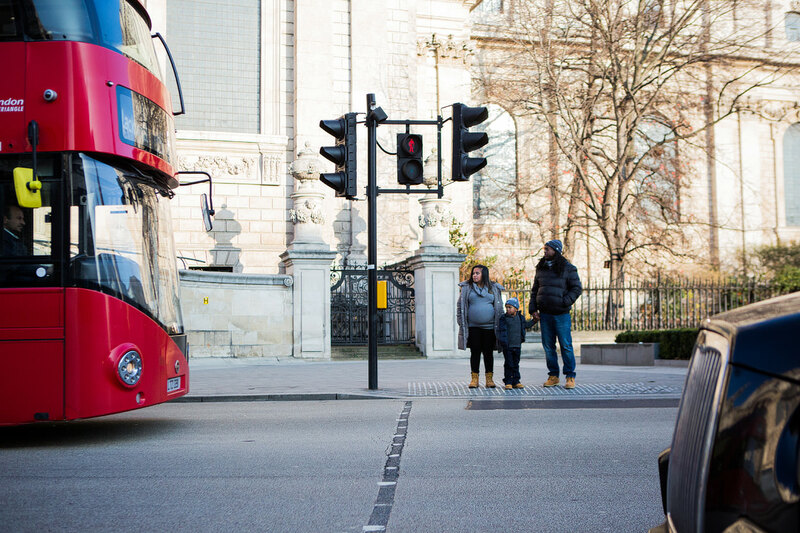 Worry not, there are plenty of other options when it comes to a London-themed photoshoot – read on or contact me to plan your London photoshoot. 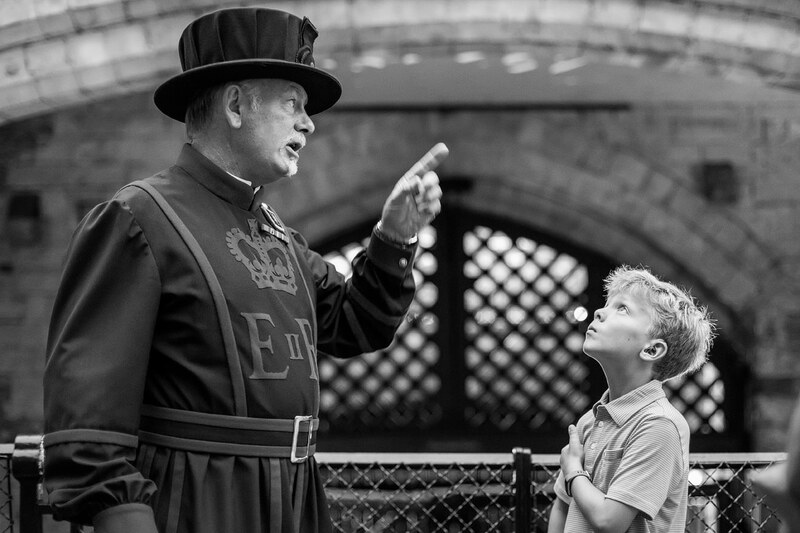 There are endless photographic opportunities around the Tower of London and Tower Bridge (and no it’s not called London Bridge – a common mistake). 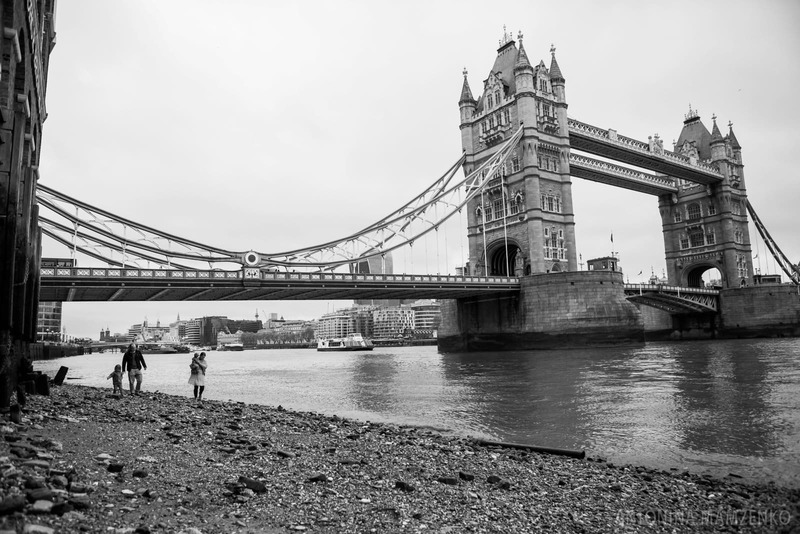 At low tide, I love taking my clients right down the river where the kids can look for hidden treasure and throw stones in the river. 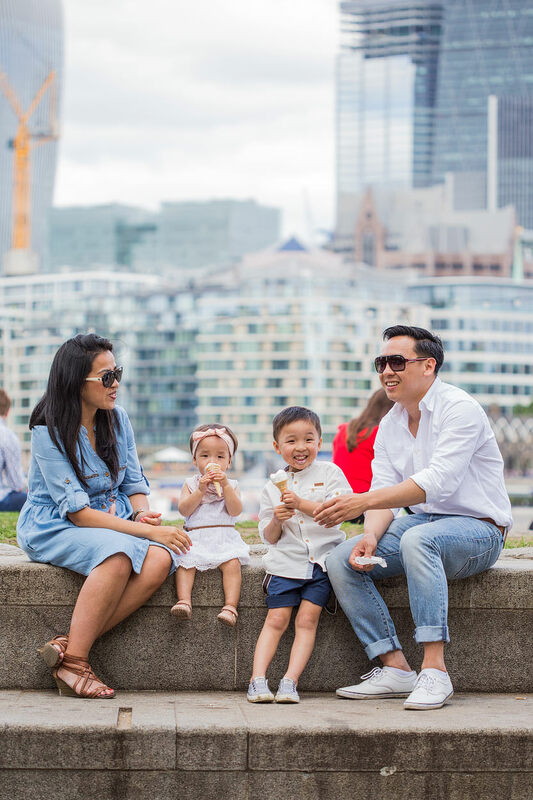 Alternatively, there’s Shad Thames to explore – a historic cobbled street full of character (and souvenir shops) and we can finish off by eating ice cream at Potters Fields Park with views over Tower Bridge and the City of London. 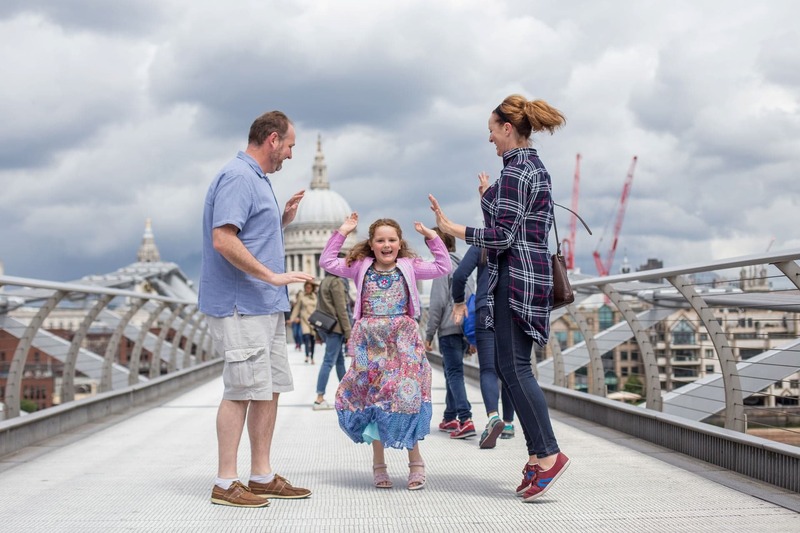 This is definitely my top location for a vacation family photoshoot right now, with a lot of great variety – starting from St Paul’s Cathedral itself and the area around it (think London red buses, the City of London with it’s bustling streets), and then across the iconic Millenium Bridge and onto Southbank – here we have Tate Modern and can either take a boat to Tower Bridge to continue our adventures, or walk over to the famous Borough Market for refreshments and more photographs! 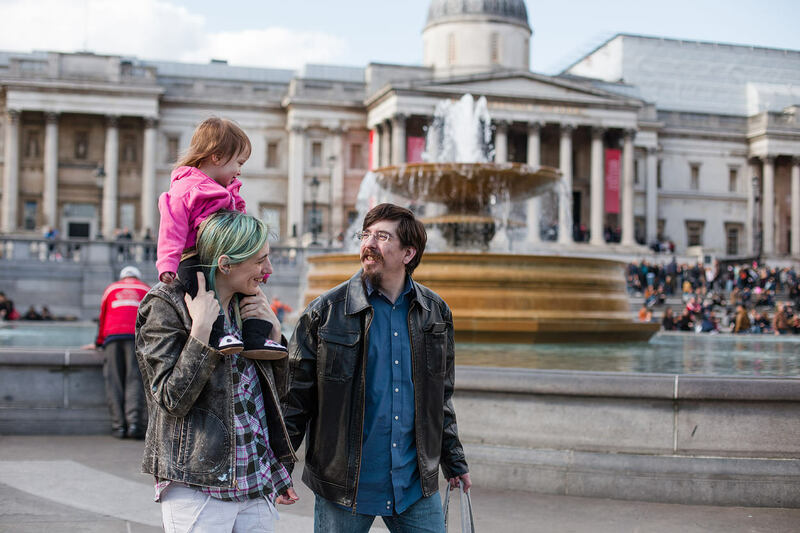 Popular tourist destinations, these locations are usually full of people but that doesn’t mean I can’t create great photographs of you exploring and enjoying your time in London. 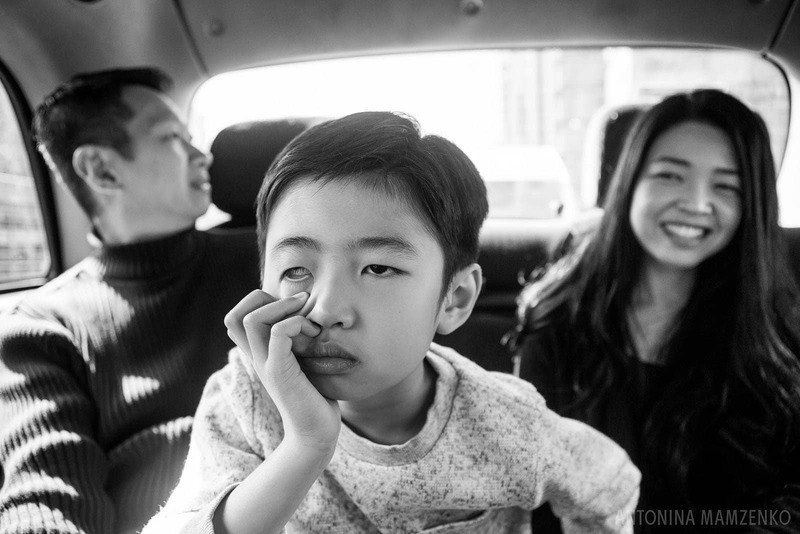 Forget awkward posing – just enjoy yourself and the children’s reactions and let me capture the magic! 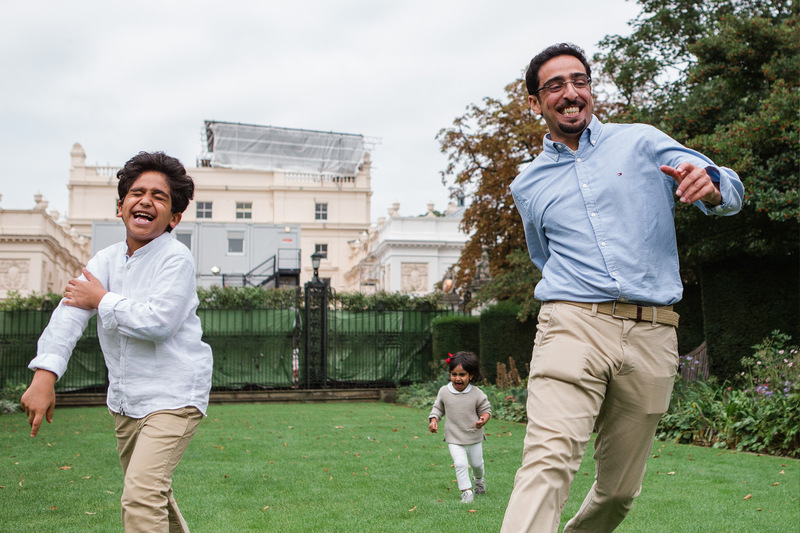 If the greenery of London is what you love about this city, there’s no shortage of beautiful parks to choose from. Many of my clients head over to Hyde Park (including Princess Diana’s Playground, the carousel, and the Memorial Fountain); Holland Park, a hidden gem in Notting Hill, Regents Park (full of flowers and hidden gardens – and then there’s also playgrounds and London Zoo) or stop by Green Park or St James’s Park in-between exploring famous landmarks to add visual variety to their photographs – and feed the ducks and the squirrels. Some of London’s hotels also have private gardens we can use if that’s more convenient – it’s always worth exploring this option. 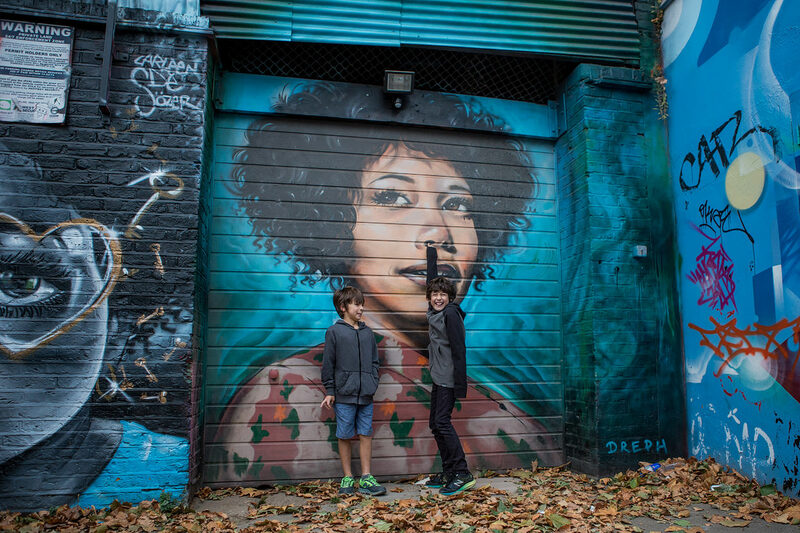 If you’d like to avoid the hustle and bustle of Central London parks, travelling a little further afield of Hampstead Heath in North London is a fantastic option. 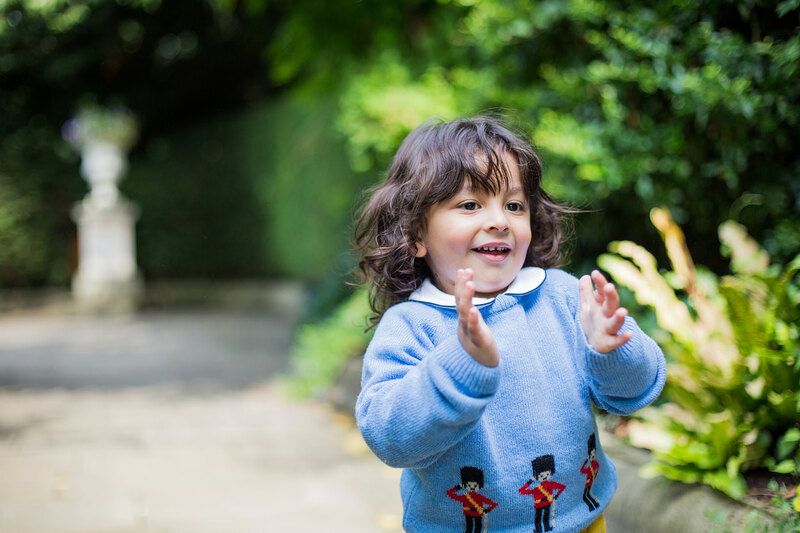 With over 900 acres of heath and woodland, as well as the famous Parliament Hill, we will be spoilt for choice and can stay away from the crowds. 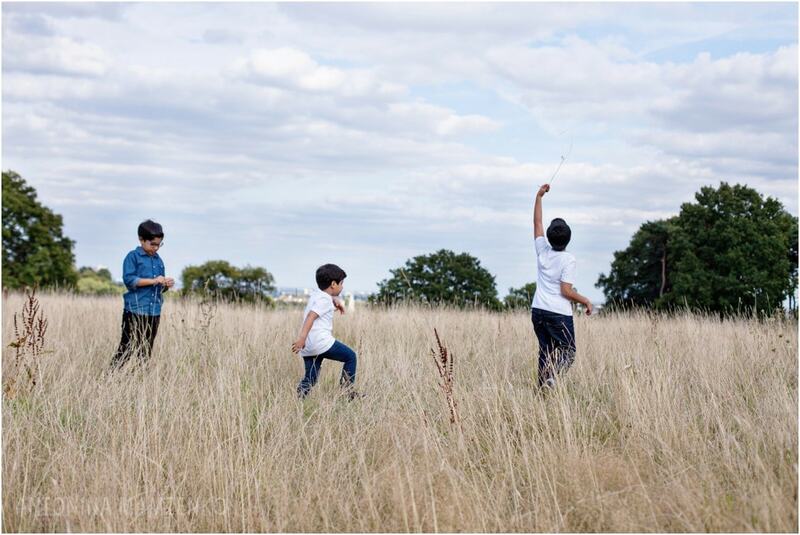 Pack a picnic, take a kite, and make a day out of it! 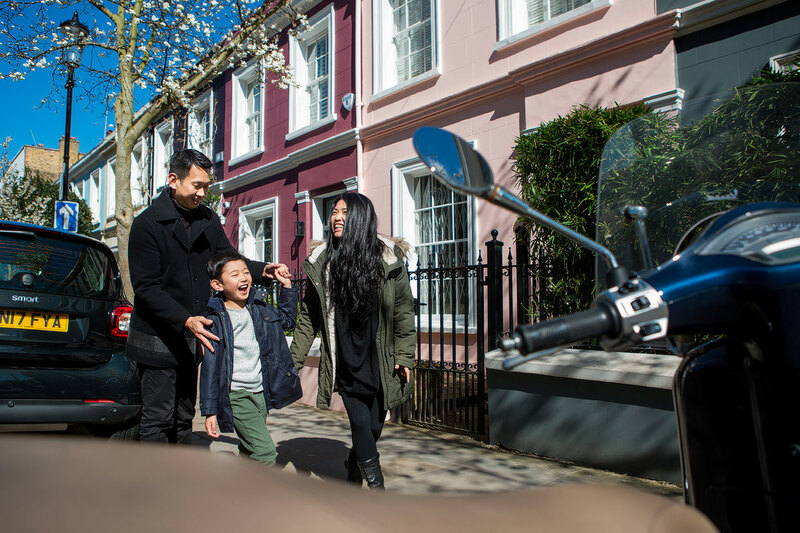 The streets of Notting Hill and neighbouring Kensington make for a great backdrop for a family photoshoot full of London character. I know the best places for the colourful houses and well as the hidden cobbled mews to take you to. 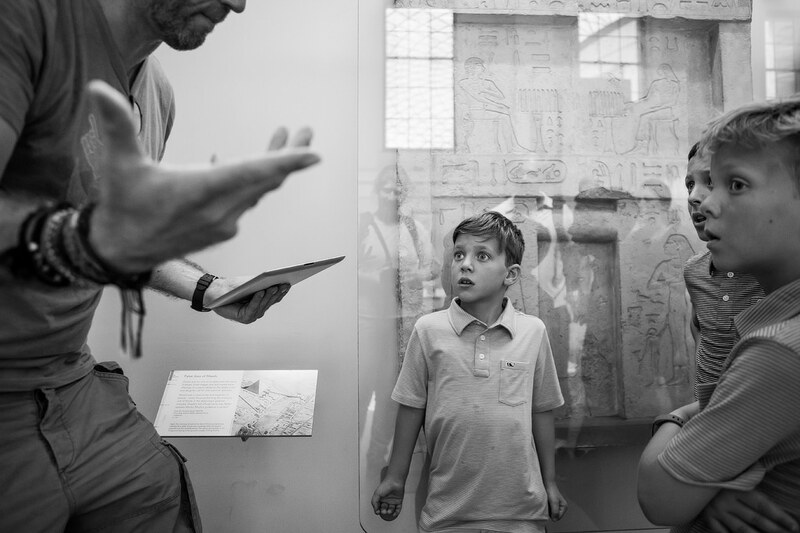 For many of my clients their days in London are absolutely packed with activities – and I happily slot into whatever you’re doing as a family, whether it’s a walking tour of London, a private tour of the British Museum, or the ceremony of the keys at the Tower of London. Children (and adults!) 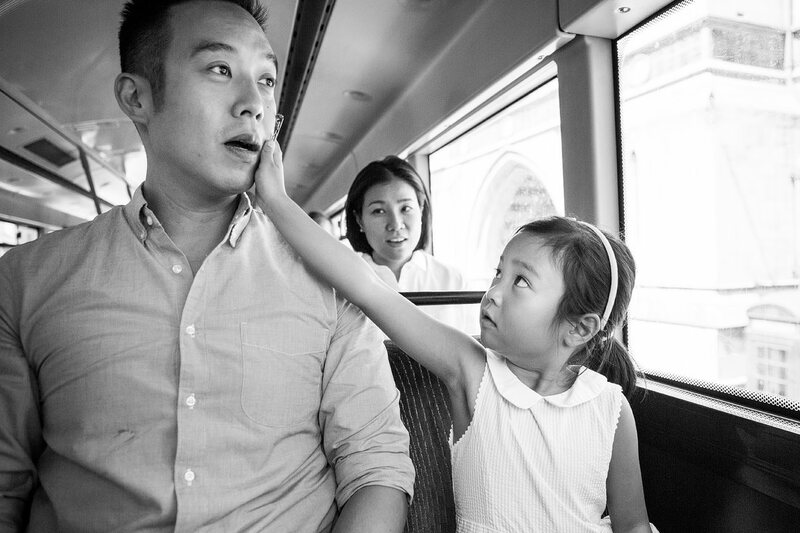 love riding London’s double decker buses and it can make a fun opportunity for family photographs too. 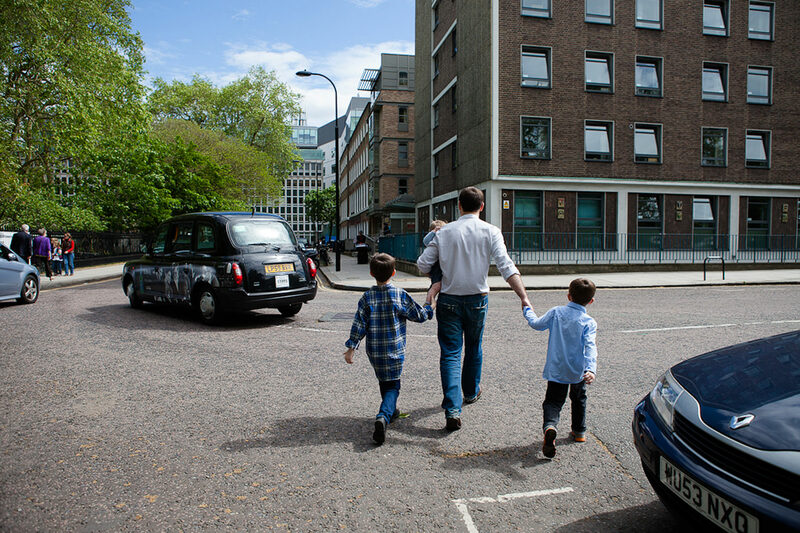 Or, if we need to travel from one location to another, taking a black cab is a great option – and the photoshoot doesn’t stop just because we are travelling! 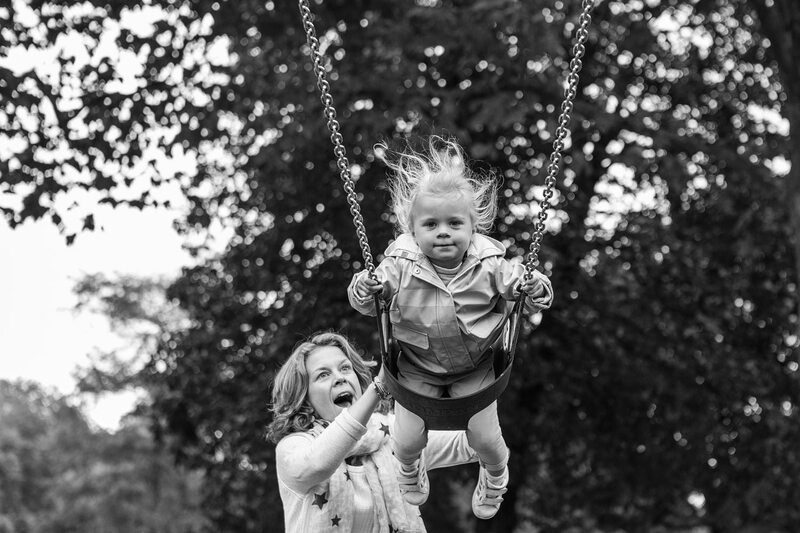 Sometimes the only way to keep little ones happy is to head to a playground. 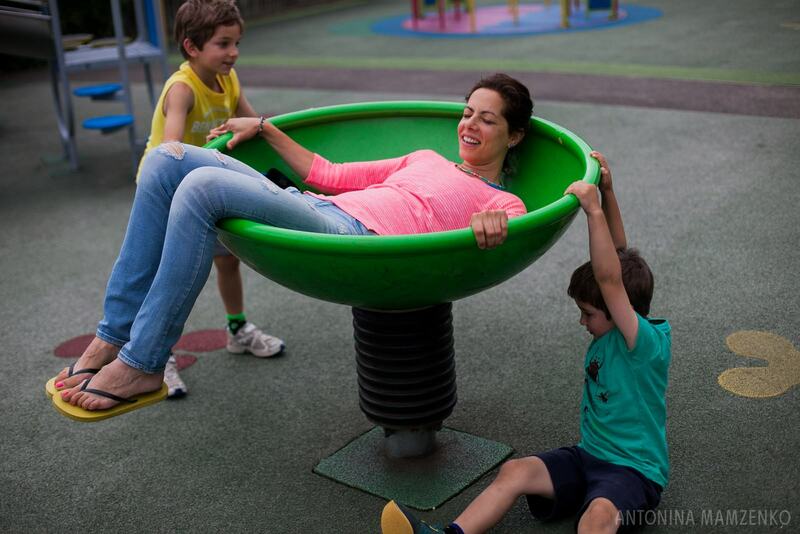 Luckily, there’s no shortage of great playgrounds in London – from the famous Diana Playground in Hyde Park (beware: it can get very busy during school holidays) to smaller playgrounds dotted around, I will be happy to advise on the best route to make sure your kids are entertained! 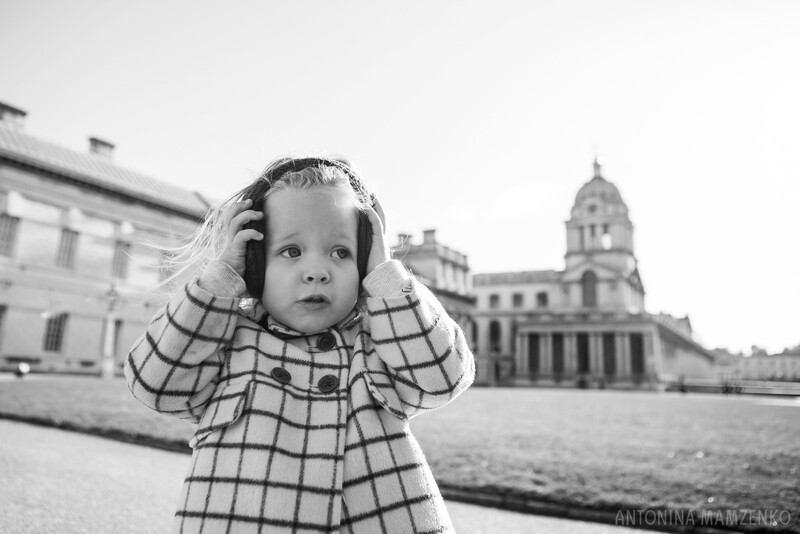 The University of Greenwich has been a filming location for many Hollywood blockbusters and no wonder it makes a great backdrop for a family photoshoot. 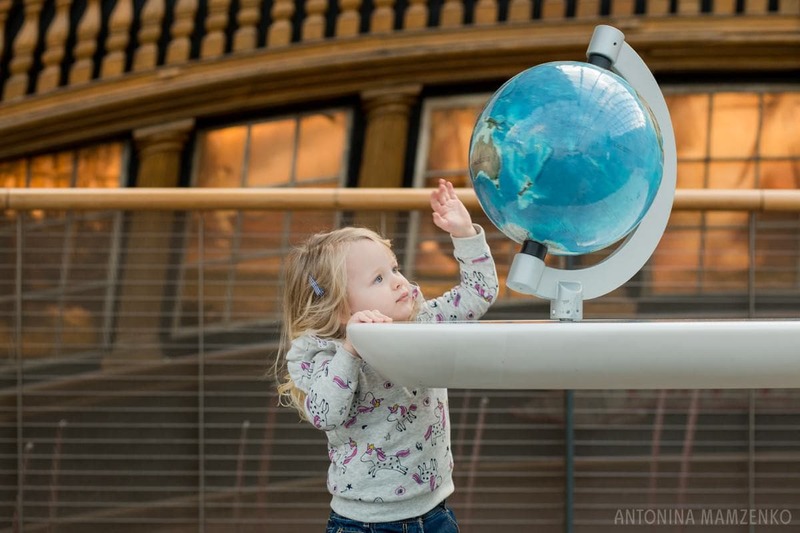 With Greenwich Park, Greenwich Market and of course the Maritime Museum and the Observatory and Cutty Sark we can spend the whole day in the area documenting your adventures there. 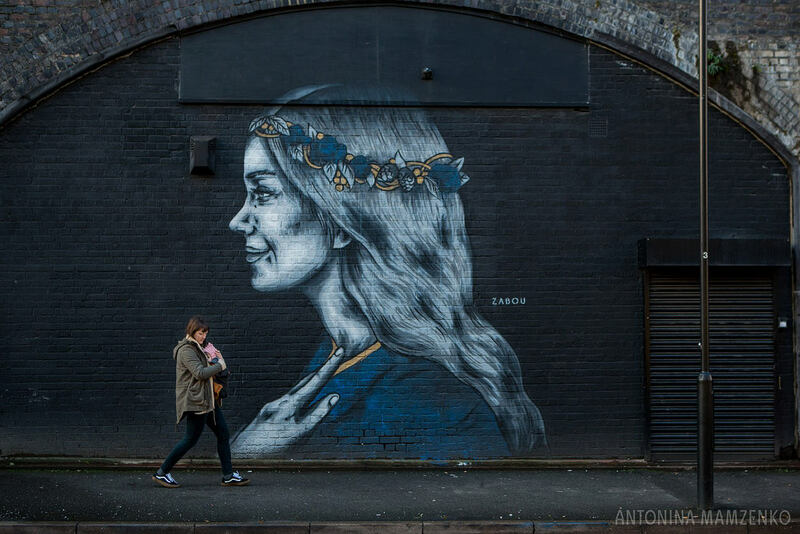 If you’re after something off the beaten track, then exploring East London with it’s street art and distinctive architecture is a definite must-have. 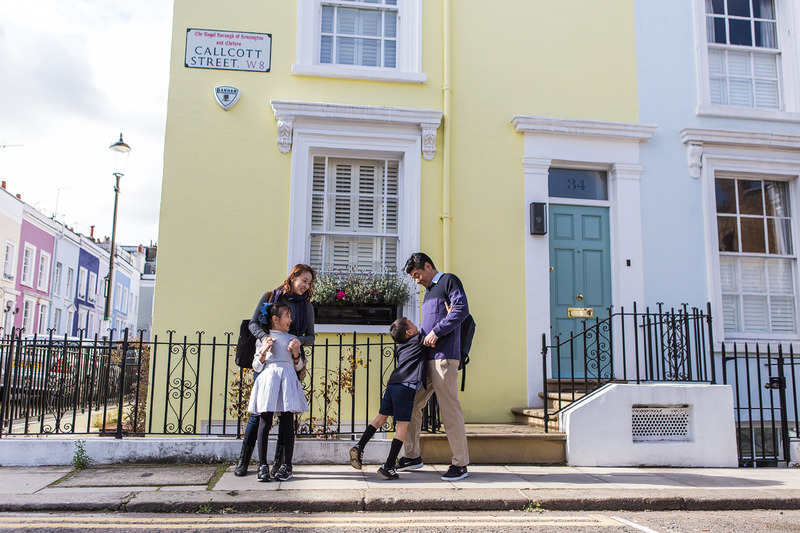 This location is very popular with my expat clients living in Islington and nearby areas when they want to capture their time in London and their neighbourhood. When booking a longer photoshoot (for example my Adventure Session or the Day in the Life), starting or finishing in your hotel suite or apartment is a brilliant option to complement the story of your stay in London. 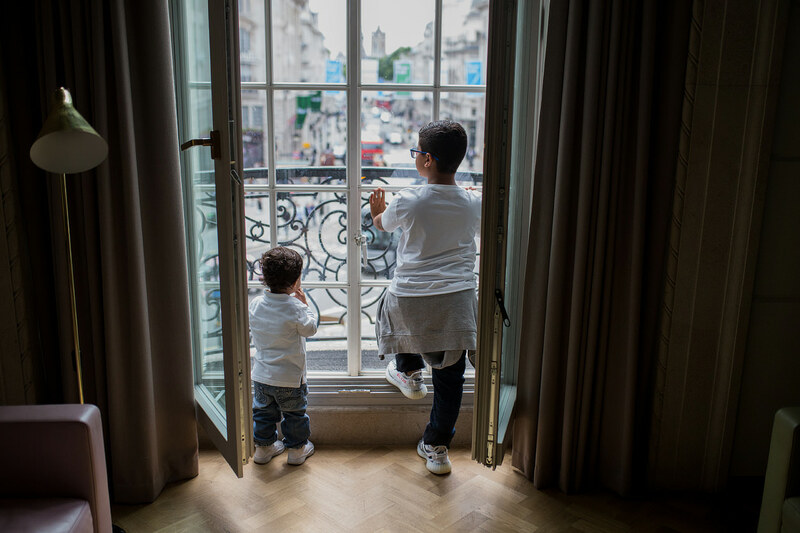 I’ve photographed at Hotel Cafe Royal, The Dorchester and Intercontinental Park Lane, as well as private and rental apartments in Mayfair and Notting Hill and the images completed the story beautifully. 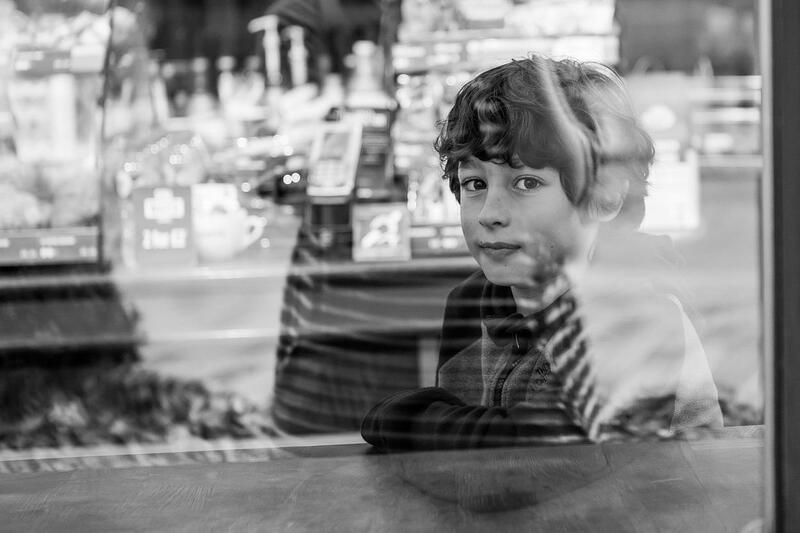 I can take great photos anywhere your adventures take you – whether it’s the back of a car, a random street in London or a cafe you’ve stopped at for refreshments. 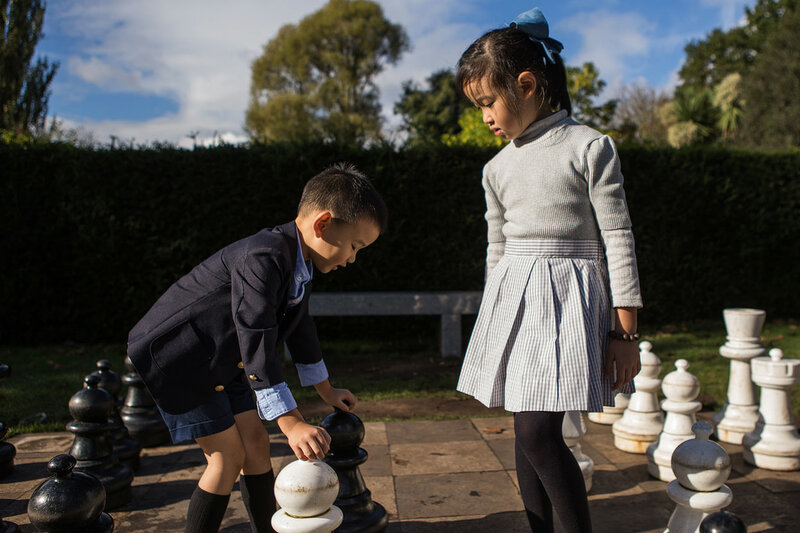 With every photoshoot, my aim is not to only capture what you look like and the locations you visit – but to document your and your children’s personalities with raw, authentic and timeless photographs. 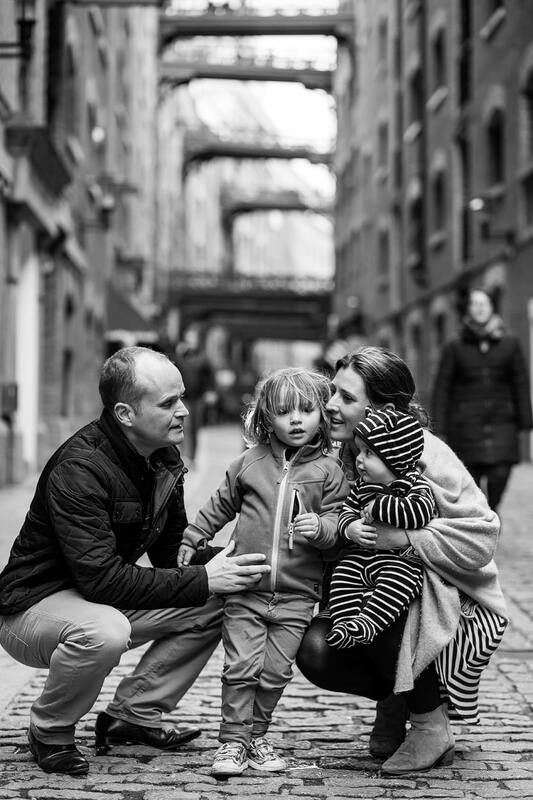 WANT TO CHAT ABOUT BOOKING YOUR OWN LONDON PHOTOSHOOT?